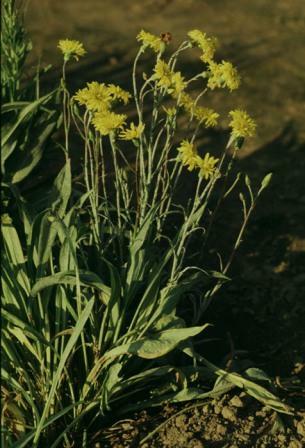 The Black Salsify is a hardy perennial with yellow ray flowers. Roots can be eaten and the leaves can be used as fresh greens for salads. The thin black taproot grows up to one 3 feet long and up to 3/4" in diameter. 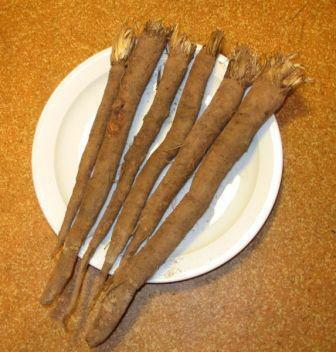 The root has a black skin with white internal flesh. In many organic gardens it's replacing a very similar crop called Salsify, because it’s roots tend to be longer, smoother, less fibrous, and of a finer texture. Black Salsify prefers deep, well drained soils. Deeper soils promote long, straight roots with few deformities. No varieties are recorded under culture. This is an armature breeder opportunity!